The trusty microwave. It's a time saver for meals in a snap yet a shortcut for truer-tasting meals. That quandary arose recently when I prepared the latest creations from GeeFree Foods. The company's newest novel products - which are just now making their way to stores and online outlets - are sandwich pockets. 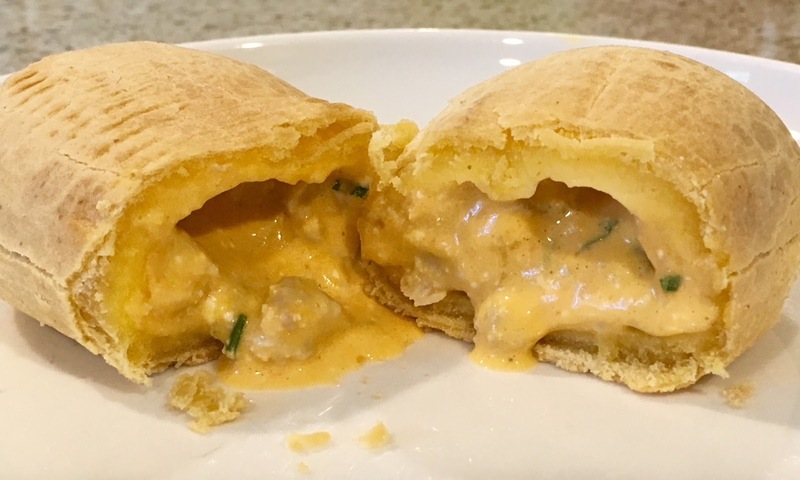 The pockets come in three savory varieties, Sausage, Egg & Cheese, Buffalo Chicken and Cheese Pizza, with each package of two having a suggested retail price of $6.99. If you're not familiar with GeeFree Foods, you should get to know it. 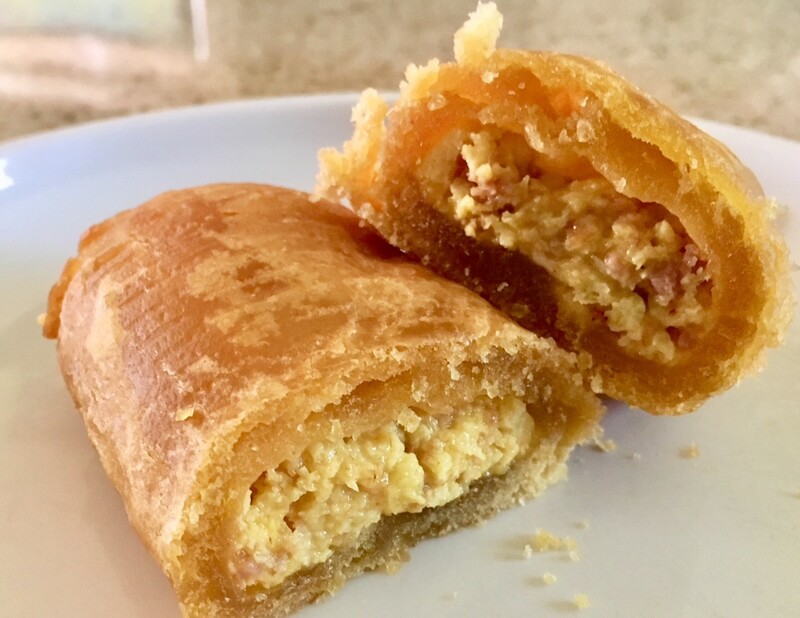 The company created a niche with its initial offerings, which include gluten-free puff pastry dough, pigs in blankets and spanakopita - all of which are unique to the gluten-free marketplace. The sandwich pockets are made with the same flaky pastry dough used for the other products. So how are these gluten-free counterparts to Hot Pockets? It depends. Each pocket comes wrapped in a microwaveable wrapper. If you want to save time, snip the corner of the casing and heat for 2 minutes, 15 seconds. It's quick, but we found the pockets to be "doughier" out of the microwave. The better - and tastier - option is to bake one in the oven at 350ºF for about half an hour. The dough comes out crispy and flakier, and the pocket has a more consistent taste from bite to bite out of the oven. We thought the Buffalo Chicken and Sausage - with a bit of zing cooled with a hint of cream cheese - and the Sausage, Egg & Cheese were the top two. I'd definitely keep a box or two in the freezer for lazy weekend days when there's more time to prepare these in an oven and enjoy an occasional splurge. 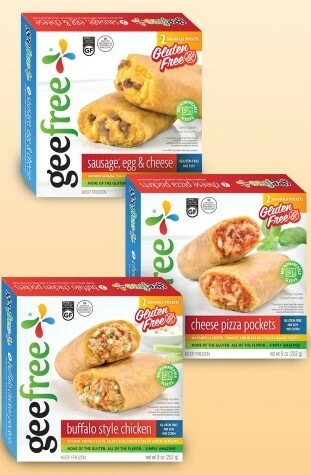 GeeFree's products are available in supermarkets and specialty stores throughout the country (product locator) and can also be ordered online directly through the company ($9.99 flat-rate shipping for six or more items) or through Gluten-Free Mall. DISCLOSURE: While GeeFree Foods provided product samples for me to review at no cost, such compensation did not influence my review. Neither I am nor any immediate family member is an employee, officer, director or agent of GeeFree Foods or its respective parent, subsidiary and affiliated entities, advertising and promotional agencies. Click here for my complete Disclosure.